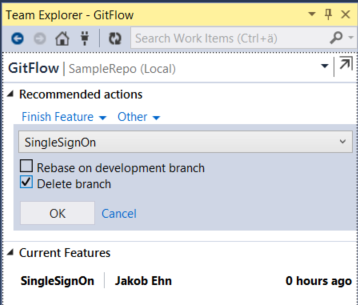 GitFlow is a popular workflow that provides a consistent naming convention to your branches as well as clear guidance on how your code should flow through these branches. 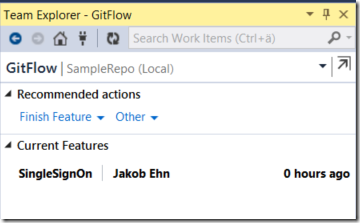 sense to implement tooling support for the workflow, which Vincent added shortly after. His repo is available at https://github.com/nvie/gitflow, although it hasn’t been updated since 2012.
functionality as the GitFlow scripts does. You’ll find the extension over at the Visual Studio Gallery, just search for GitFlow in the Extension and Updates Window. Install it and restart Visual Studio, as usual. 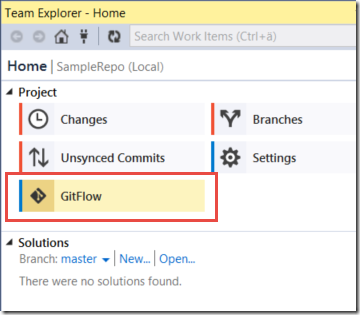 By clicking Install, the extension will copy the necessary files into the Git for Windows directory, and run the install script for GitFlow. (Note: Since copying files into the %ProgramFiles(x86)%Gitbin directory requires elevated priveledges, this is done by running this as a elevated Powershell script. You can also set the Tag prefix, which will be used when you tag a release or hotfix branch as part of finishing up those branches. 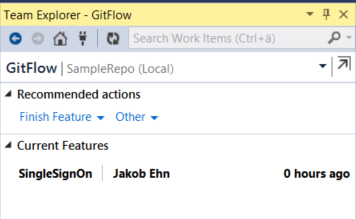 Note that all output from all GitFlow operations are sent to a separate output window pane in Visual Studio, which is activated when the command start. branch, so from here you would typically either start a new feature, release or hotfix branch. Clicking Start Feature will let you define a name for the branch. 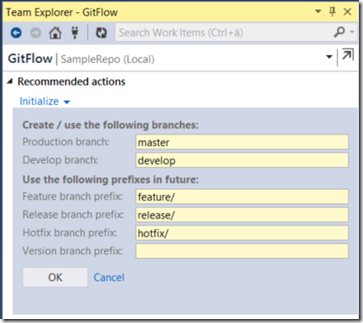 GitFlow will add the feature branch prefix for you so don’t include that. Note that all other actions are still available from the Other menu. In the GitFlow world, you are allowed to have multiple feature branches but only one release and hotfix branch at any single time. In fact, if you try to create multiple release branches, you will get an error. As you can see, if you hover over a feature will get some more details on it, and if you right-click on it you can (depending on the state), checkout, track or publish the feature branch. I will be looking at adding more functionality here in the future to make is even easier to use this workflow. This is a great value to our team. One idea for a feature request we had was to have an option before starting a release or a hotfix to show the most recent 2-3 tags in the repo. 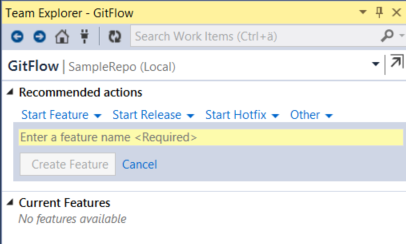 Since we are tagging by version per git flow and thereby naming the release/hotfix by the next version number, I still have to pull up source tree or the repo to get the last version of the specific project we used. This featurewould allows us to completely dump Source Tree 🙂 Great job on such a clean extension! Thanks for the feedback Jason! I replied to your feature request on GitHub! 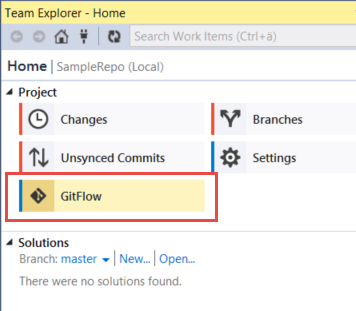 when I click gitflow in team explorer it says no gitflow and suggests to install it, 2 windows flash fast one is powershell the other is command prompt, and nothing happens it still suggest to install gitflow, i went and installed gitflow manually and tested it on the command prompt and its working. @M. Hasim: that is strange. 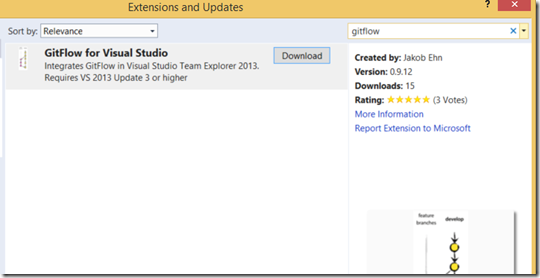 Can you check where you have Git installed? The extension tries to locate the git installation path by first checking the PATH variables, then the registry and the default to program files (x86)gitbin. 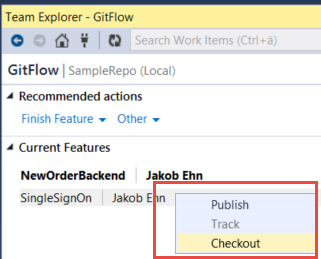 In this path, the extension then installs the git-flow bash scripts a few dll:s that gitflow uses. Can you check if you have these files installed there? Any chance there can be some integration with Work Items? Like I can right click a bug on the query results and start a new feature or hotfix or bug? @rob: That’s a great idea! Would you mind posting a issue request at the GitHub site? 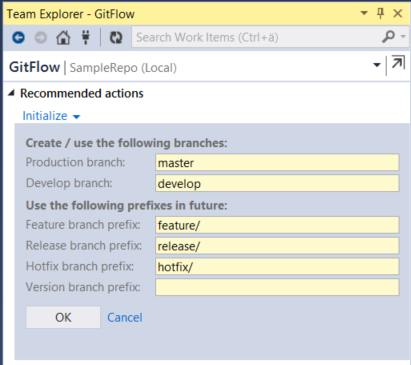 As per Vincent Driessen post, a hotfix needs to branch out from master and it perfectly makes sense to do so, but the gitflow.vs has options to branch out a hotfix while in develop. Why did you have hotfix option in develop, what’s your thoughts? But I have it installed and it’s in the path variable. The same here. Could you resolve it? 10x Jakob for this great extension! One issue so far, I noticed that when starting a new feature (under VS online), it gets incorrect user name and date. Looks like it picked the guy who created the repo/branches. Hi Tomer, this is standard Git behaviour. Until you have committed something, the branch points to the previous commit and the corresponding user. Thanks for using the extension! I’ve noticed that the Feature branch Author name and Date are somehow taken as the last user pushed changes. Sorry i am leaving a comment here since your book post does not allow me to comment. Does your latest Apress book cover Git on TFS ? Hi! It does not cover Git in any detail, it does talk about important practices around source control management when it comes to continuous delivery, such as branching patterns, branch policies and protecting your mainline. I don’t know of any good material on Git in TFS, there is of course a lot of material on Git. Is your book for sale on Amazon? Do you have a link? Title? How do i Initialize / Confirm the settings are correct if the initialize button was never shown ? 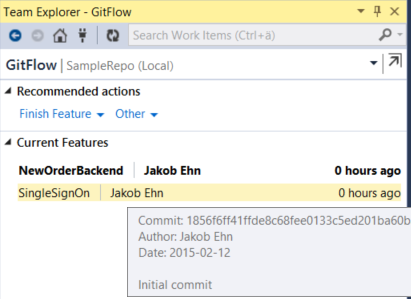 Any plans on adding support for the git flow support command? Looks like a great add-in, thanks for making it. You can also use SourceTree that also have great support for git flow, and more room to implement it on (-: Team explore is to cramp for my test. But some people prefer to leave VS.
Hi I have tried the add-in and have some questions around rebasing. 1) Will any support be added to redirect you to the merge conflicts screen directly to resolve them? 2) Will any support be added to display the “continue rebase” menu option when conflicts are resolved without running command line? Hi! I have a question about Pull Requests and GitFlow. 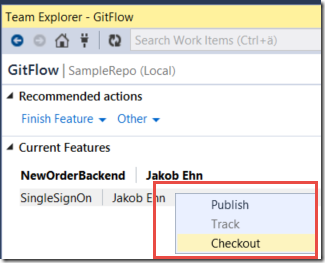 Does it make sense to incorporate pull requests into the GitFlow plugin? 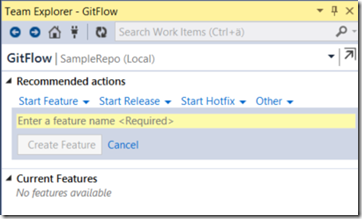 Example 1) “Finish release” merges the “Release branch” into local master and origin/master if specified. But in this case the testing should have been done in the release branch, therefor no need of a pull request? 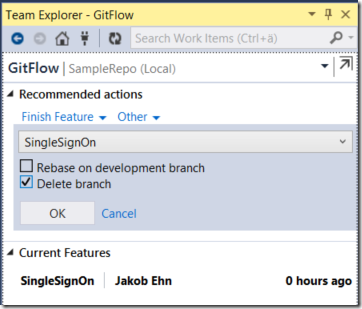 Example 2) “Finish feature” merges the feature branch only to the local develop branch? In this case there will be no need for a pull request from the plugin? Or does the “Finish feature” also have the option to merge to origin/develop? Johnny did you ever find out? I want to use PR’s with GitFlow but am unsure if it works together. at Oct 12, 2017, but latest version on marketplace is dated 1/3/2017, 8:40:07 PM. Please, could you publish the latest version with squash feature to marketplace? I would like to ask the same question as Damir Šmigovec.